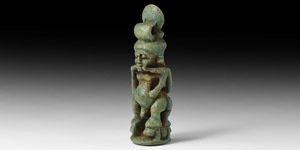 A finely modelled dark green glazed composition amulet of the protective dwarf-god, Pataikos, standing on two crocodiles, eating snakes, suspension loop above; the other side falcon-headed dwarf wearing the sun-disc and lappet wig. 13.7 grams, 60mm (2 1/4"). Very fine condition. From the property of a London gentleman; formerly from a private UK collection formed in the early 19th century. Cf. Andrews, C. Amulets of Ancient Egypt, London, 1994, p.39, fig.36.